… their eyes were blindfolded for four days and four nights; and, in the meantime, the friends and relatives were all invited to partake of food and drink. At the end of this period, the catolonan took the young girl to the water, bathed her and washed her head, and removed the bandage from her eyes. The old man said that they did this in order that the girls might bear children, and have fortune in finding husbands to their taste, who will not leave them widows in their youth. Among the non-Christian minorities, the above-described rite is not performed. But there are other practices that are considered as substitutes. Sometime in their middle teens, the maidens and youths have their teeth filed down. A group of her boyfriends will rally round a girl in her house and hold her down tight while one cuts her teeth down – no matter how much she screams from the excruciating pain. After the operation, one lad will take a pencil-sized twig from a guava tree or the stem of a batac plant, heat it in the fire, and rub the warm bark on the teeth: thus, stopping the blood and easing the pain. Thereafter the shortened teeth are strong for chewing – even bones, and picking the teeth after eating is unnecessary. … When it is all over, wreaths are hung up and a gala time is had with basi [fermented wine], chicken, and rice. When Bukidnon girls and boys reach the age of puberty, they are believed to be old enough to chew betel nut and at the right age to mutilate their teeth. From then on they are considered mature. Meanwhile, Mandaya youth file and blacken their teeth upon reaching puberty. These are considered aids to beauty which help a young person find a suitable partner for marriage. Bagobo youth follow the same beautifying treatment as the Mandayas. Once their teeth are properly filed and blackened, a young man or woman is deemed ready to enter the society of older people. In Northern Cotabato, after Manobo boys and girls have filed and blackened their teeth, they undergo the ceremony of tasting new rice which qualifies them for admission into full manhood and womanhood. The Negrito girl and boy of Northern Camarines and part of Quezon, in their pubescent ages, become conscious of their teeth which they take great pains to blacken so as to look attractive. 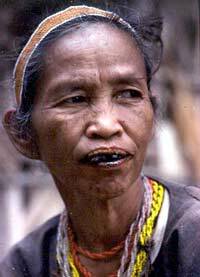 Also in Northern Camarines and perhaps before, throughout the former Tayabas, boys and girls had their noses bored before marriage, for they were believed to look much better when wearing a nose-stick.